Description: Small evergreen tree. Holly is an evergreen tree or shrub with a grey, smooth bark usually Height between 10 m - 15m in height but reaching 20 m in cultivation. It is found in woods, scrub, hedges and rocky ravines up to 550 m in the mountains. The hairless, leathery, alternate leaves are dark green above and lighter beneath, with a very narrow, pale margin. They are up to 10 cm long on short stalks less than 10 mm in length. The margins are normally undulate with large triangular, spine-pointed teeth, but on old trees and upper branches the leaves may be spineless. The male and female flowers are on separate trees, so only the females produce red berries. The white, scented flowers, with 4 sepals and petals, are arranged in tight clusters and open in May. The twigs are green and only slightly hairy when they are young. Tolerates a wide range of soil types - from acid. to poor and calcerous Locally can form almost pure woods. Suitable for hedging and pollarding. Tolerates shaded positions in beech and oak woods. Native to British Isles. Particularly found in West but absent from Northern Scotland. Also Western Central and Southern Europe.The holly is a tree which is both a broadleaf and an evergreen. It is a common native shrub or small tree throughout the UK except for Caithness, Orkney and Shetland. Holly is shade-tolerant, and common in many oak and beech woods as an understorey. Creamy white wood dense with even grain. Uses of wood - Formerly used for carving inlay and engraving. Twigs yield birdlime. Good firewood even when green. Food and drink - Trees were pollarded and used for winter feed especially in North and West of England. Berries are poisonous though used as an emetic. Seed deeply dormant. Distributed by birds eating berries.Treat as Acer campestre but start treatment in January for sowing the season after next. Approximately 22000 seeds per kg. There are 400 species of Ilex in tropical and temperate regions across most of Europe, North Africa and Asia, with many more forms in cultivation. The holly native to Britain and Ireland has the Latin name Ilex aquifolium. It has dark green leathery leaves, stiff and sometimes twisted. They are readily distinguished by their spines. These prickly leaves protect holly from browsing deer and livestock. Higher up the tree the 'prickles' or spines may be absent from the leaves. Holly is often planted for ornament; numerous cultivars or varieties exist with variegated or two-coloured leaves and different coloured berries. 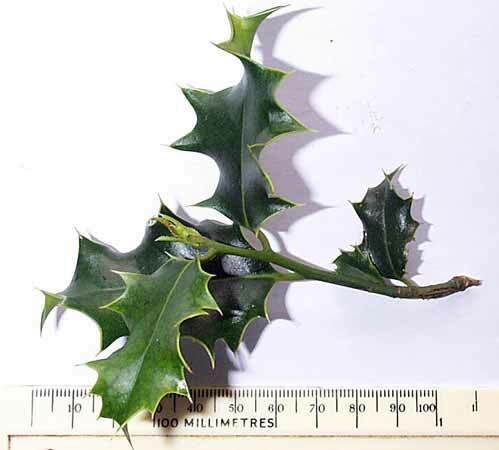 Holly is normally dioecious - which means it has separate male and female plants. The flowers are white and appear in summer. The ovary ripens in October to produce a bright red berry containing four 'nutlets' or seeds. In the wild trees start to produce berries when they are 20 years old. The berries are an important food source for many birds, such as thrushes, fieldfares, redwings and waxwings. If uneaten, the berries will stay on the tree until the following May. A good crop of berries is said to be a warning of a hard winter on the way but, in fact, a bumper berry crop is not a sign of bad weather to come but the result of a fine summer just past. The wood is white or greyish white and generally featureless though sometimes with greenish streaks. It is much denser than that of any other native hardwood. Like boxwood, it is used for carving, inlaying and woodcuts. When dyed it resembles ebony.. Many a holly tree was spared the woodman's axe in days gone by because of a superstition that it was unlucky to cut one down. This belief probably arose because of the tree's evergreen leaves and long lasting berries, leaving people to associate holly with eternity and the power to ward off evil and destruction. Holly has long been a symbol of Christmas and is often used to decorate houses at this time of year.Its berries are said to symbolise drops of Christ's blood.The colour red was used to ward off evil, witchcraft, the evil eye, demons and house goblins such as Robin Goodfellow, Brownie and Hobthrust. In Ireland the holly was called the "gentle tree" and the favourite tree of the fairies.Leaves of a female holly would be placed under the pillow to foresee the future in dreams.